Save the date post cards are really popular. 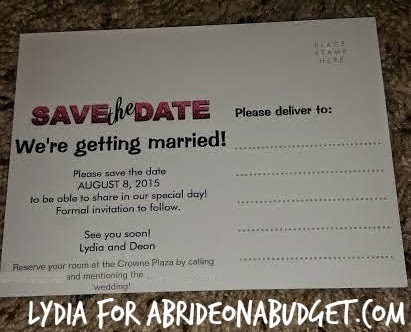 They're generally a bit more budget friendly than save the date cards because there are less components (you don't need envelopes and you only need half the amount of paper when compared to a folded saved the date card). Stamps are also cheaper for save the date post cards -- and believe me, wedding postage adds up. Lydia (who you may remember from these amazing bridesmaids boxes) told me she ordered save the date post cards. Initially, I was super excited. I mean, anytime someone takes a step in wedding planning, I get excited. 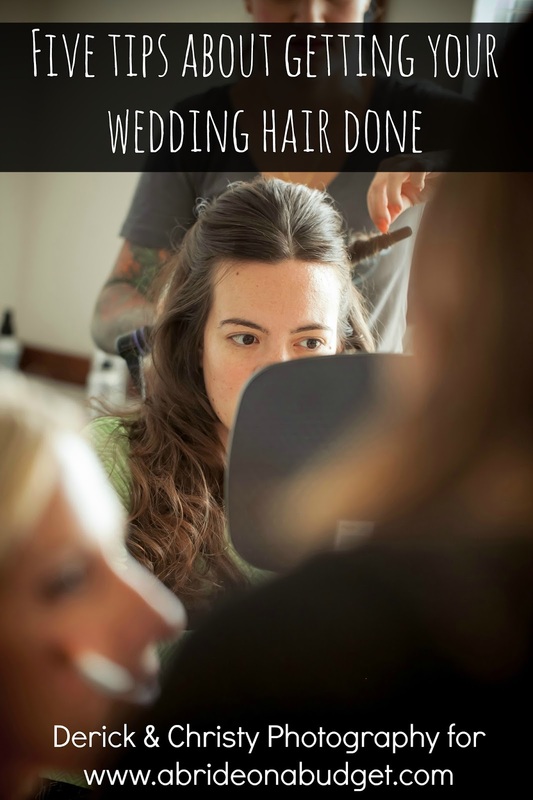 The glittered pink is gorgeous and goes really well with their fiesta-themed wedding. The save the dates and simultaneously simple and stunning. She really hit the ball out of the park on this one. So of course, initially, I was so excited for her. And then I got worried. 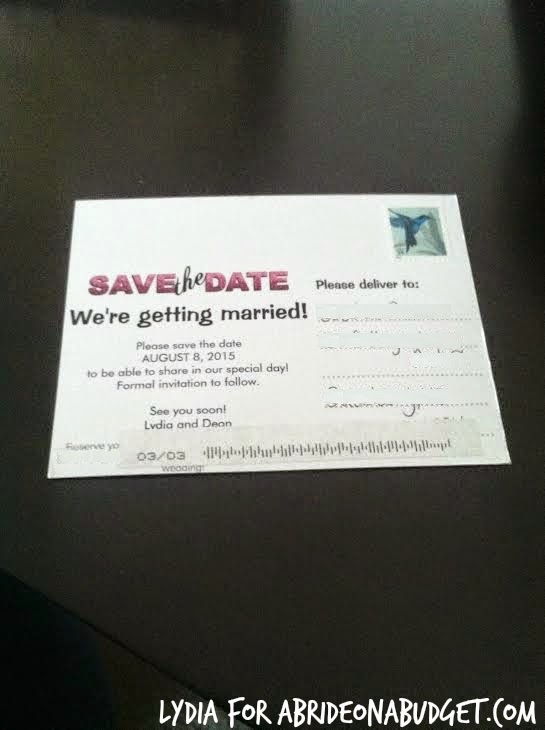 See, there's a concern no one takes into account when ordering save the date post cards. But you can. Because I'm here. Here to help anyone who wants to send a save the date post card. Because I'm not saying don't send them. I actually really like them and think they're great for your stationery budget. I'm just saying keep this in mind. Second of all ... don't hate me. When the post office mails them, they'll put a tracking sticker. We got a save the date post card once where the tracking sticker was on the bottom left on the backside of the post card, blocking all the information. You have info in the same place (the phone number of the hotel and the following text). But at that point, her save the date post cards were already in her home. All she could do was address them and cross her fingers. (I should mention, quick, that I removed part of the information in some of these pictures. After "by calling" she put the hotel's phone number. And between the words "the" and "wedding", she put her and her fiance's last name's, since that information is necessary when calling the hotel. I blocked them out, though, to save Lydia from potential wedding crashers. I also blocked out her friends' addresses because no one likes unsolicited pen pals except me). Her post cards started arriving at their destinations and one of three things was happening. First, there was the dreaded sticker I worried about. You can see text sticking out from the left side, so the recipient knows something is there. He can easily pull the sticker off and read the text underneath. He'll still know how to call the hotel. And, worst case scenario, if the sticker pulls off a number or two, the recipient can just text Lydia and ask her what to do (and, honestly, a ton of people ended up texting us to get the hotel information for our wedding even though it was printed on our invitations, so be ready to field calls no matter how accessible you make the info). Then there was the dreaded stamp. Same tracking reasoning as the stickers, but this time, it was printed right over the text. The phone number and last names dodged this bullet, but the hotel's name got mangled. You can read it if you know what it says, but it's a little bit of a pain. But again, wedding guests, just text Lydia. She'll get you where you need to be. And then there's door number three. This time, there's no sticker. No dreaded lines. Just a nice postmark up top. I'm guessing the tracking sticker was on the other side somehow, but that speculation hasn't been confirmed. 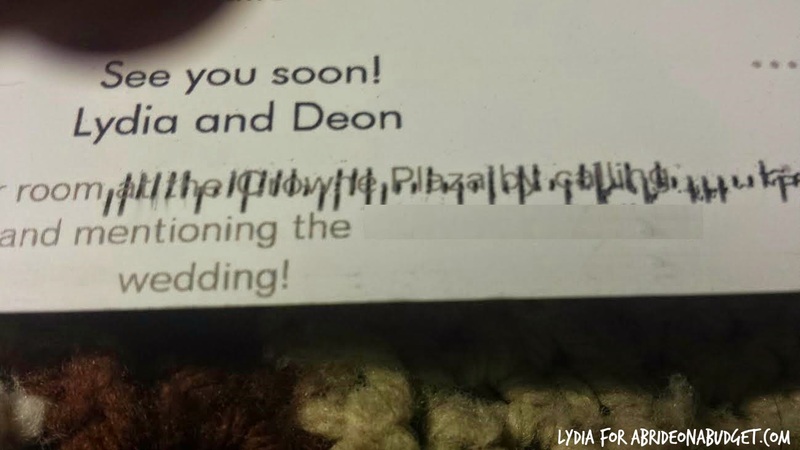 This save the date post card is the best, obviously, because all the information is easily readable, but you can't guarantee that this is how they will arrive. So you have to be mindful when you're designing your postcards. Leave space at the bottom for the dreaded tracking and leave space at the top for a potential postmark. Basically, if you split the left side of your post card into quarters, focus on keeping your text in the second and third quarters and leave the top and bottom ones blank. It'll save you from worrying about how they might arrive (and if you're like me, you worry about anything so if you can put out a fire before it starts, it's worth it). 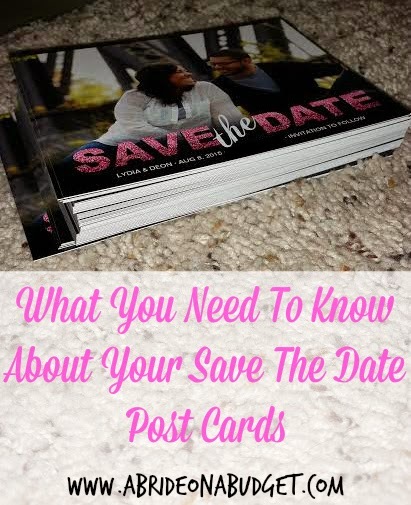 If you're looking for save the date post cards, you can check them out at Minted, Wedding Paper Divas, MagnetStreet, and Zazzle. And you can find Lydia at @lgtz85 on Twitter. 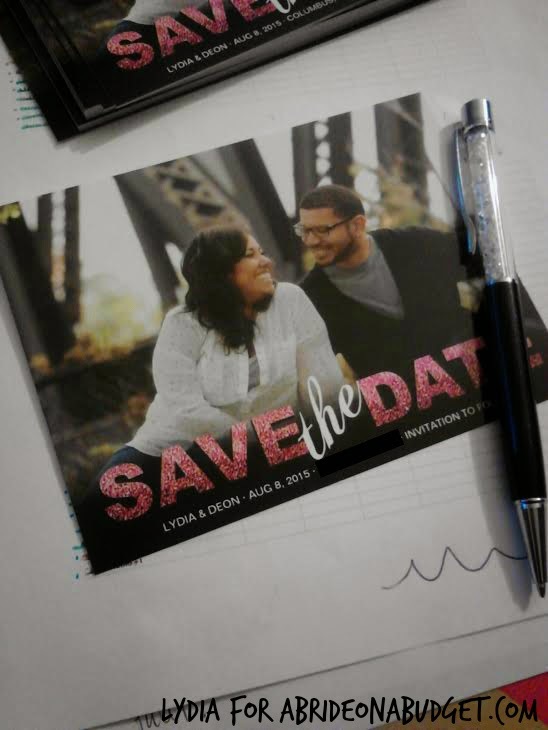 Be sure to tweet her and tell her you saw her amazing save the dates on A Bride On A Budget. Big thank you to Lydia for being so kind and sharing these with us and helping future brides plan out their save the date post cards. 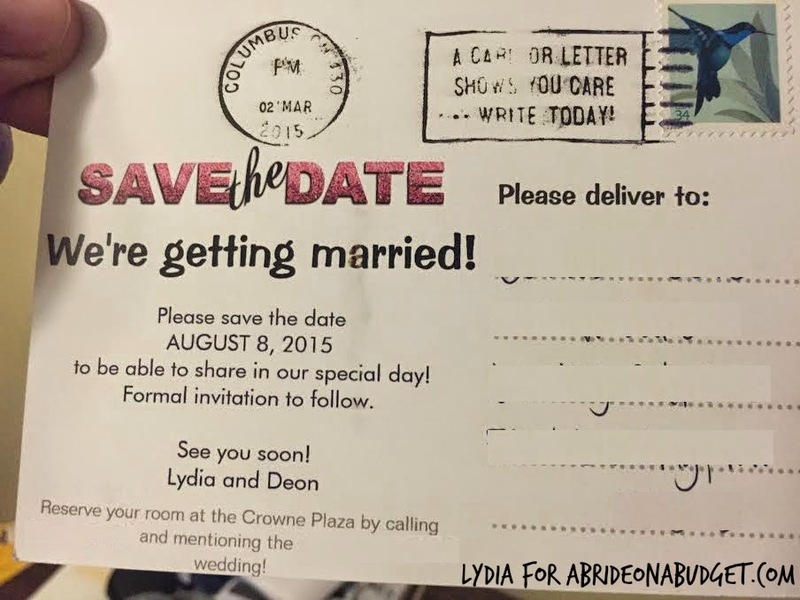 BRIDAL BABBLE: Is this something you thought about when deciding on your save the dates? 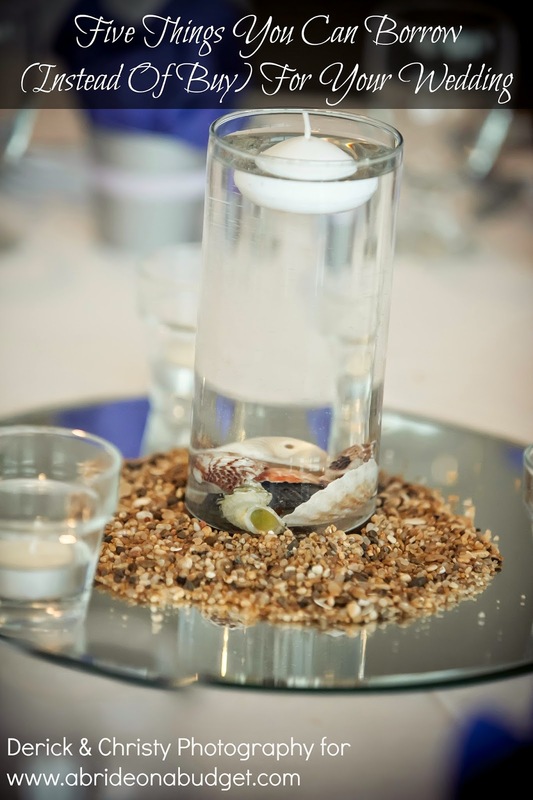 Awesome post and very useful information, and I love the site Minted!! 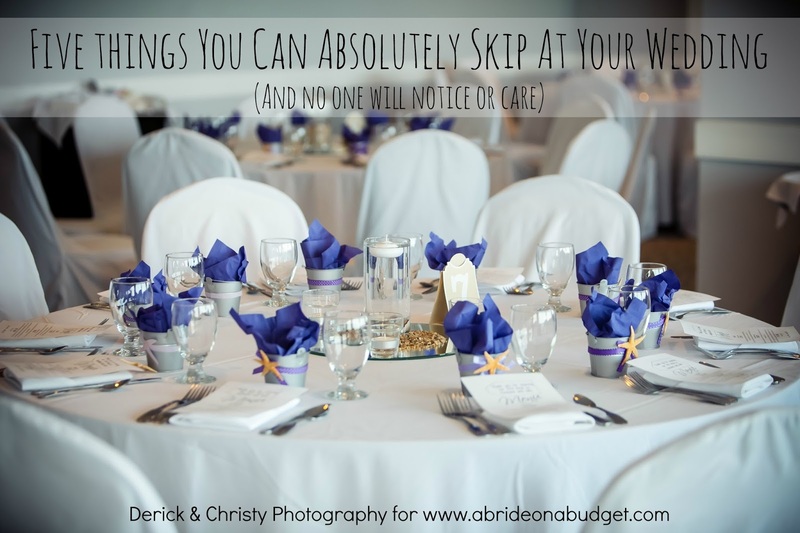 My go to site for invitations and such! The concept of printing things yourself rather than having them professionally made is also a great money saver.